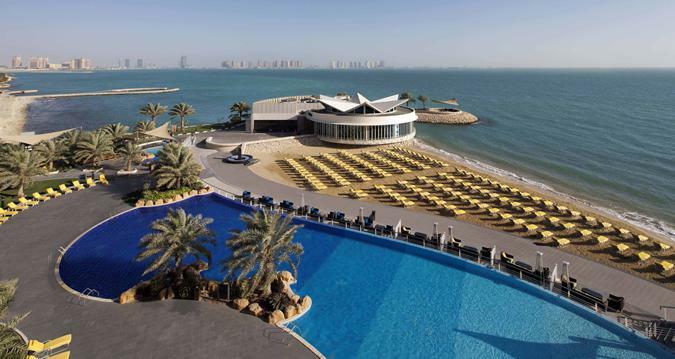 Rising above the Persian Gulf, this ultra-modern hotel is 1 km from the corniche and 7 km from the Souq Waqif. With floor-to-ceiling windows, the rooms and suites feature free Wi-Fi, flat-screen TVs and custom-made beds. All have marble bathrooms, minibars, tea and coffeemakers and Gulf views. Club rooms have balconies, and club lounge access with refreshments, while suites add living rooms, and 1 has a kitchenette. Room service is available. Parking is free, and a buffet breakfast is available for a fee. There are 3 restaurants, including an open-air spot, plus a cafe, a bar, an outdoor pool and a private beach. There's also a spa and a gym.